Rakusan did not include the Fan Series in his main sequence numbering. Therefore, the original number used for each of the 36 Series prints has been modified to identify the Fan Series members of its theme. The five different fan silhouette shapes have been here assigned arbitrary numbers 1 through 5. To indicate a fan design these shape designations are added to the 36 Series number separated by a hyphen. 125-4 is the Fan Series design with fan shape 4 in the 125 Pussywillow theme. Like all other designs in this series, 125-4 was only produced in a single print run, and few copies are currently documented. All five fan designs (including 125-4) have seal C, which indicates a carving date during the first half of 1934. Despite the early completion of those wooden blocks, Rakusan delayed printing and distribution of the prints in what became the 125 Pussywillow theme at least for several months. It was eventually grouped with other winter season themes nearer to the end of the series. However, the 36 Series design 125 has seal B which indicates a later carving period closer to the time of publication. The composition of 125-4 includes several branches of pussywillow. Among them, standing in a body of water suggested by wavy lines, is a little egret on one foot. Light snow (suggested by flecks in the background and on the bird) is still falling. 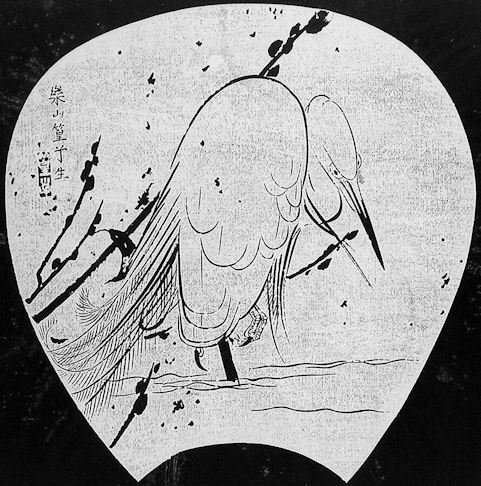 The pussywillows are shown as silhouettes, but the egret is carefully sketched as a fine line drawing. 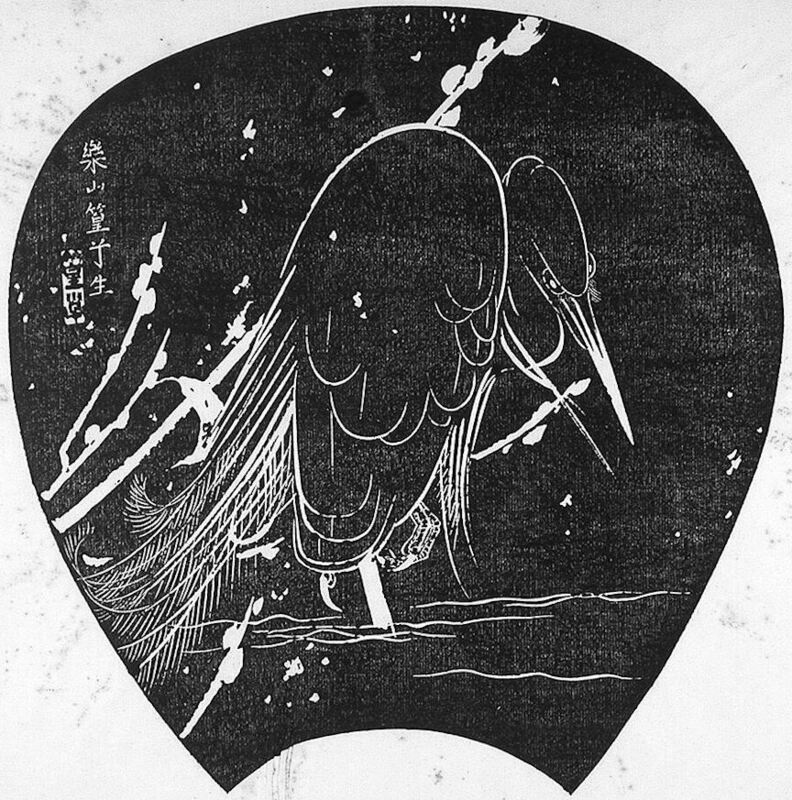 Except for the falling snow which is white only in the ishizuri version, the rest of the composition is painstakingly carved so that the ishizuri version is an exact negative of the original sketch. Notice in the reconstruction that the leg of the egret is dark and the foot light as in life. Little Egret, Egretta garzetta, is today usually called 小鷺, こさぎ, コサギ, ko-sagi, lit. 'small heron'. For the title caption of 100 Series design 2 Rakusan instead used used 白鷺, shira-sagi, lit. 'white-heron', which is a general name for any white egret species. He also modified it with a rather poetic descriptor, 蓑, mino, 'straw raincloak', a type of old-style-rural rain protector. This refers to the way the breeding-plumage aigrettes stand out from the backs of the birds, rather like the way the stems stick out from the loose straw bundles used in the crude raincloak.